During festive season, my mom makes this delicious balls for us. My father and I just love this dish so much. My mom learned this dish from my maternal grandmother. 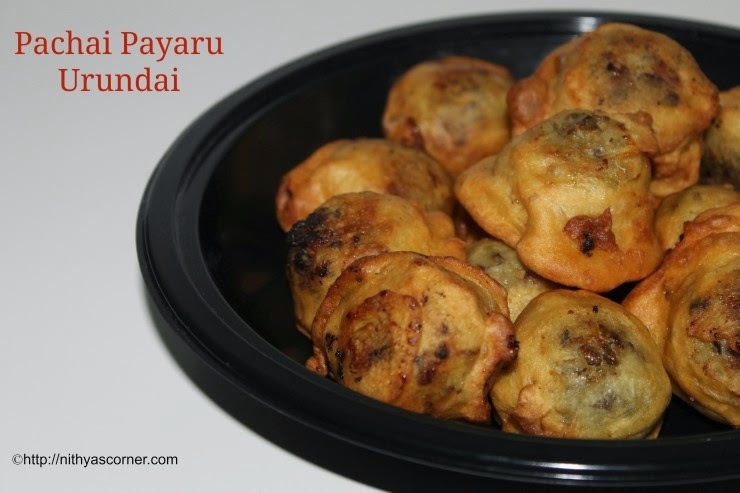 It is very similar to suzhiyan recipe but taste very good. The outer part of the balls would be crispy and the inner part would have the sweet stuffing. I learned this recipe from my mom when she came here to help me for my second pregnancy. I can never say no to these balls. I can have a maximum of 7 to 9 balls. It tastes good on the next day too. Try it out and I am sure you’ll like it. 1. In an open vessel, boil whole moong dal using five cups of water. It will take about twenty five minutes. Let it cool down. I boiled in an open vessel because the moong dal may get overcooked in pressure cooker. Once it cools down, put it in a large mixing bowl, and add grated coconut and sugar . You can also pressure cook moong dal using 4 cups of water. It will take about 15 minutes. 2. Use your hand and combine the cooked moong dal, coconut and sugar well. While mixing, mash the moong dal little. Now make balls out of the mixture. Shape the balls in such a way that the balls should be firm enough. Do it one by one until you are done with the mixture. 3. 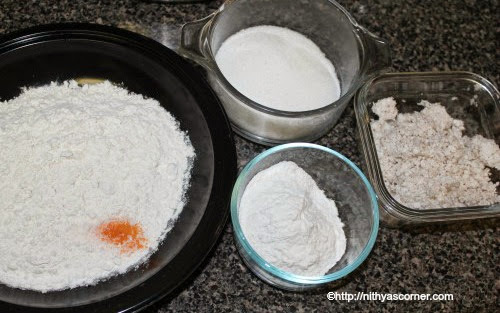 In a large mixing bowl, combine all purpose flour (maida), baking soda, three tablespoon sugar, saffron color, and salt. Add little water and make a thick batter. 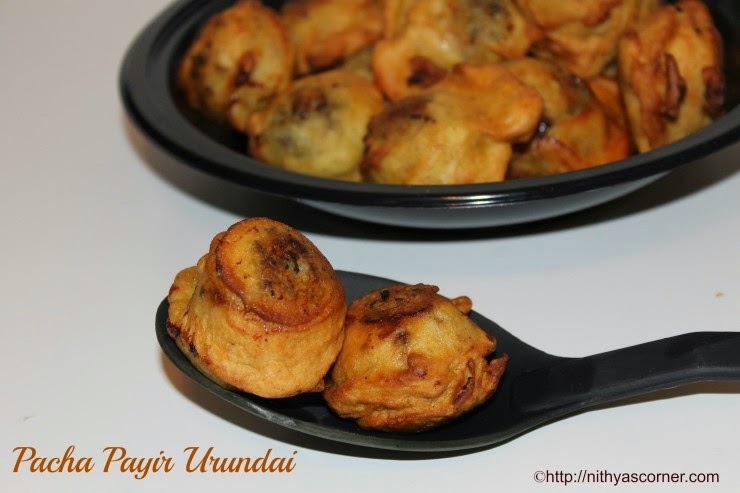 The consistency of the batter should be thicker than the bajji batter and similar to the bonda batter. Heat oil (medium to high flame) in a frying pan. Meantime, dip a ball in the batter and get it coated well. 4. While the ball is getting fried, coat all the balls in the batter and drop them one by one into the oil. Do not crowd the pan with balls. There should be enough space around the balls while getting fried. Once the balls are fried on one side, turn them over to cook on the other sides. Cook until the balls turn golden brown. Once the balls are cooked, take them out and cool them down in a tissue paper to remove excess oil. 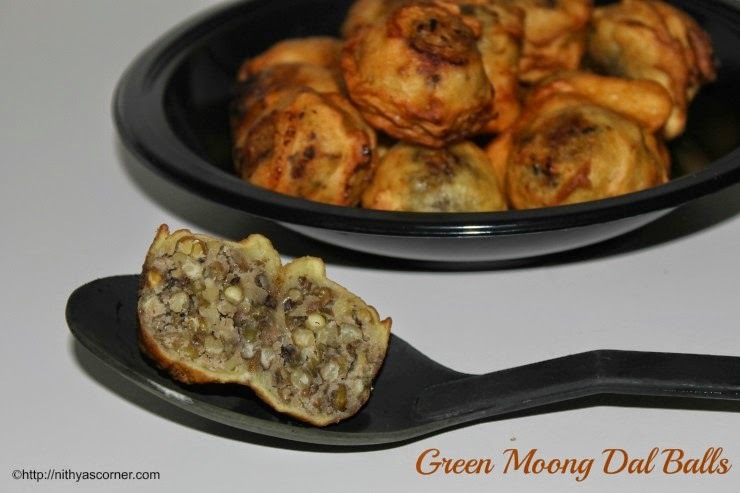 Now Sweet Moong Dal Bonda is ready! This entry was posted in Paniyaram on November 22, 2014 by vikashbhardwaz.